Several years ago I made some Easter Bunny juice boxes as a birthday treat for my son’s class. I posted a couple of pictures on Pinterest that became quite popular, so I thought that I would add a little tutorial to go with the photos. With this free printable bunny juice box wrap, you can transform a juice box into a cute and healthy treat for kids. The first thing that you need to do is print the wraps and ears. I printed the wrap on plain white paper and I printed the ears on card stock so that they would be a little bit sturdier. Then, you can cut everything out. I designed the wraps to print 2 per page. I find that every brand of juice box is a different size, so you might have to play with them a little bit. With some brands, you will be able to just cut the sheets in half lengthwise and use them, but other brands may require some extra trimming. Update: I recently added a second version of the juice box wrap that will fit tall, skinny juice boxes better. Both versions are included in the printable. Use the one that works best for your juice boxes. Pull the straws off the juice boxes before you wrap them. You can tape them back on at the end if you like. Wrap the paper around the juice box so that the bunny face is centered on the front of the box. Tape the edge to secure it in place. After you have secured the wrap on the juice box, attach two ears and a cotton ball on the back of each box with hot glue or glue dots. 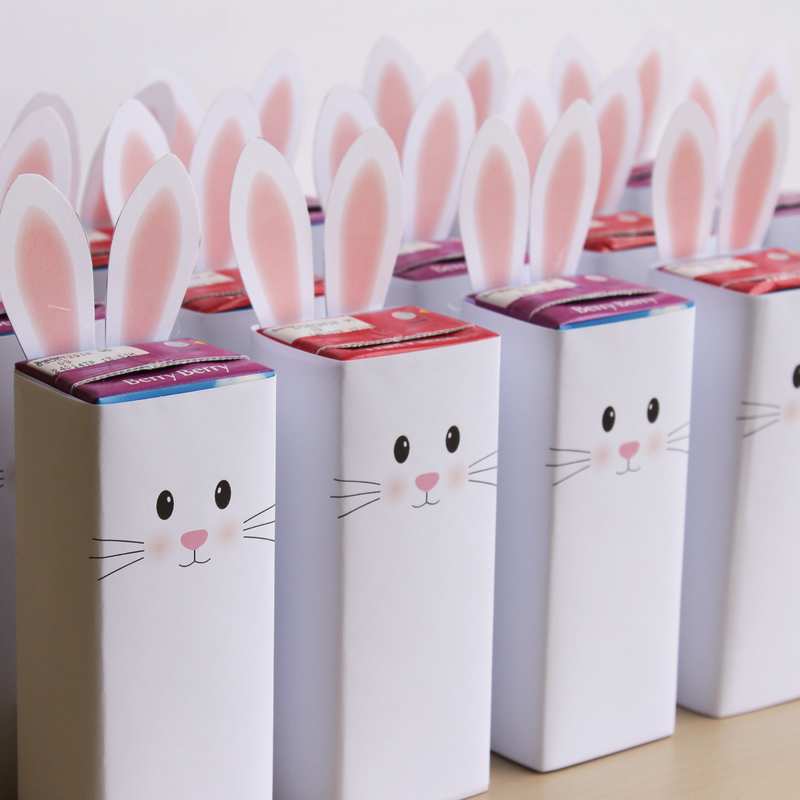 Now you can add the bunny juice boxes to your snack table….perfect for an Easter party or Spring treat. Cuteness! To get your copy of the free bunny printable, just fill in the form below with your name and email address. I will send the printable directly to your inbox. I am so excited that you signed up! Check your email to get your ABC Clip Cards. Are you looking for bunny-themed learning activities for your kids? Check out the following spring-themed products in my store.